User Review: "JazzHR puts the "jazz" in recruiting!" JazzHR is our primary recruiting software - encompassing collection of resumes, scheduling, corresponding with applicants, and anything else involved in the recruiting process. Departments use JazzHR as positions become available in their area. It keeps everything in one place and makes corresponding with applicants a BREEZE. Highly recommend this product to any and all. Allows for mass letters to applicants for phone scheduling and interviews. Keeps applicants organized in "pools" of consideration. Links to Outlook so it's easy to see when and where to schedule. Great software for creating recurring templates for recruiting letters. Would be great if JazzHR had a "Doodle" software incorporated into it. I currently use "Doodle" to create available times, then link it to my recruiting letters within Jazz. Make it easier to connect Outlook when someone is not on a network. Downloading cover letter and application separately would be better. This software is EASY to use! JazzHR has thought of most of the components of the recruiting process and incorporates them well. Review: "JazzHR- Great tool to manage and track applicants"
JazzHR is being used across the whole organization as a way to manage candidates in the interview process. It aims to organize and proceduralize the interview, examination, collaboration process for potential employees. When an interview is underway, I use it to retrieve pertinent information (contact information and resume). And once the interview is underway, I use it to take notes and share with colleagues that are interviewing the same candidate. Ability to take notes during candidate interviews. Ability to collect pertinent candidate information (contact information + resume). View resume in new window to allow the ability to review resume while taking notes. Prompt user with 'next best question' depending on answers to standard questions. Ability to customize and save questions for future applicants. Create user specific templates. JazzHR is well suited to track candidates and organize the information that is captured in the interview process. It also is a helpful tool to capture and access information about the candidate such as contact information and resume. It helps me coordinate with colleagues the tracking and progression of a candidate through the hiring process. Most importantly, it allows me to discuss candidates by referencing my feedback and interview notes. Review: "Can't beat JazzHR! Great UX and support!" We currently use JazzHR across our whole organization to accept and manage applications. We also use it to store assessments, interview notes, and other candidate information. We recently integrated VerifiedFirst, for background checks as well. We have been using it for around five years and it has allowed us to scale our growing business in an organized fashion, while ensuring timely communication between candidates and our hiring teams. I think JazzHR could help any business achieve their hiring goals, whether they be faster recruiting, seamless candidate experience, and/or documentation. Review: "JazzHR - An Excellent Applicant Tracking System"
We use JazzHR throughout our whole HR department as well as managers in other departments that help with recruitment and applicant tracking. Customize-able workflows (recruiting stages) for applicants to go through. Great reporting usage and organization. Overall a great applicant tracking system that allows you to add tons of information and be detailed throughout the hiring process. The reporting could be better, not as many options as I would like. For example, you can't see when an applicant was put in a certain stage in your recruiting process. And it wont let you see how many people you hired in the last 90 days, it will only show people you hired who APPLIED in the last 90 days. I think it is great for any company all in all. I don't see any instances where it would not be helpful. You can have many users and you have multiple options for purchase based on your budget and needs. JazzHR Review: "Simple and Easy Solution"
We are using JazzHR across the entire organization. Job Requisitions. They do handle approvals, but for a true recruiter we need more than just an approval. Applicant account. It would be great to not have the candidate complete the application each time they apply. Allowing them to create a login and store their resume and easily apply. With a smaller organization, JazzHR is a great solve to recruiting needs. For those that are still on a paper application, this system will drastically and instantly create more efficiency. As an organization grows, so does it's needs for greater metrics. Using requisitions allows for more metrics and insights to assist in staffing and budget planning. JazzHR Review: "Works well for us." JazzHR helps us hire positions for every department. I use it in Human Resources to post jobs, review resumes, etc. Managers of other departments use it to monitor how their jobs are doing and give feedback on resumes as they come in. JazzHR was our first ATS software—prior to this we did hiring completely by hand, using printed resumes and manila folders. JazzHR streamlines this process and allows us to keep everything in the same place, add interview notes, access prior candidates for new jobs, etc. Jazz is fairly intuitive and easy to use. Allows us to see at a glance which candidates are in which stage, etc. Allows for automated emails, to be sent immediately or scheduled, providing additional transparency to a candidate. Not all features are fully functional. For example, the integration with Microsoft Outlook struggles when there are "all-day events" on the calendar that aren't marked as busy. Since we use those type of events frequently, it makes that functionality difficult to use for us. Not optimized for mobile use, unfortunately. I would really like to be able to do phone interviews, etc, on my mobile device. For us, JazzHR was a good entry-level product. It improved our processes significantly. It may not be as helpful to a larger company that needed more functionality, but for the price, it's great. JazzHR Review: "Doesn't Fit Third Party Recruiter Needs"
The first day we began migrating all of our data into the system we found that the architecture of the system had 0 functionality for a third party recruiting firm. While other companies were upfront that they had no functionality with recruiting firms, Jazz HR definitely does not take that route. Easy user interface. Straightforward layout. But does not meet the needs of a third party recruiting firm. We asked to cancel our membership but Jazz HR wanted us to pay the full amount. I offered to pay for the first month to compensate the time for the sales rep and training rep. After some extensive complaining, they graciously allowed us to pay HALF a year for a service we will never use. Make sure you try the entire free trial before purchasing anything from this firm. 0 Functionality for third party recruiting firms. No refund policy even with 0 use. A lot of functionality for HR departments. None for third party recruiting firms. JazzHR Review: "Jazz keeps us sane"
Our whole team is using Jazz HR for recruiting our new full-time staff, part-time, and even bringing our volunteers on board. The workflow for each position is different so it solves our problems of managing those three processes. It's a very big help to have all the documents and notes about each candidate from every stage in one place that's secure and shareable. And the initial screening step is invaluable to let us focus on follow up with truly quality candidates. Initial screening. New candidates can be vetted with a go/no-go simple button, or individual staff can give a vote. This helps weed out candidates we don't want to pursue, and also allows our team members with interest in the hire to indicate their vote without a final decision. Interviews are built in to Jazz and are really simple and flexible to use. Each interviewer records their own notes with their own perspective. Questionnaires are easily created and sent out to candidates as part of the automatic workflow. I'd like to see interviews have some shared questions for situations with multiple interviewers to see the real-time notes that others in the room are taking. Reporting is robust, but still leaves room for improvement. I think you can pay for premium reporting that will dive into your unique workflow stages. Jazz is great for our smallish team with a significant volume of candidates. Easily posting jobs online is great for us and saves a lot of time. I could see that a larger company with far more job postings may need a more robust platform, but we're not there yet, and won't be for years. I use JazzHR to manage candidates that have applied online. It is used in every department to keep track of candidates and applications. Customizable fields for the applicant/candidate process. Easily tag managers on comments for candidates. Send emails to candidates easily through the system. Easy to see duplicate candidates and delete or merge their files. Can assign stars to candidates and managers can vote on a candidate through the system. Can set up Questionnaires to help screen candidates. The search function within a particular job can stick often. The search runs but the search box won't collapse to see the results. If a candidate applies for one position but is better suited to another, the comments and files don't transfer when you add a job. Parsing a resume sometimes requires you to upload rather than drag and drop. When adding a document to a candidate file, the system prefers a PDF and upload. It won't drag/drop. Wish it count the number of candidates in 5 star, 4 star, 3 star, etc. buckets. It's a great software. All online, so nothing to install. Allows for easy communication within an organization. Job postings, email communication, and questionnaires are integrated to make it easy to use. User Review: "JazzHR IS ALL THAT JAZZ!" We use JazzHR in human resources for recruiting and applicant tracking. JazzHR streamlines our processes and saves us time. We are able to track communications to/from the applicant and to hiring managers as well as schedule interviews. We set up the job posting and JazzHR sends it out to the free job sites for us. It streamlines the process of finding the qualified applicants and filtering out those that do not meet job qualifications. The reporting features help keep us on track showing us monthly statistics and trends. The ease of use for our staff as well as for the applicant is excellent. 85 percent of our applicants apply via a mobile device and the application process is simple, easy to use and mobile friendly. No common templates available for eTemplates (Federal Tax Forms, I9, etc.). The process for eTemplates is time-consuming initially (however, once you have it done, it's done). When using eTemplates for new hire paperwork, there's no capability to copy/transfer information so it doesn't have to be entered more than once (i.e. new hire address/personal info is needed on tax forms and I9 - they have to type it in on each form). Although there are good reporting tools, there are some limitations on custom reports. Anyone receiving applications for various positions on a regular basis could use this system for tracking and reporting. Companies with applicants that have limited computer skills but some mobile device skills, JazzHR is a great system to help them in applying for a job. If you only have one or two positions and not looking for regular applications coming in, then this would be more than you'd need. JazzHR Review: "Great app for recruiters who consistently have spots to fill"
We used JazzHR for all hiring purposes. It allows managers in different areas access to see and rate applicants. Allows for all applicants' information to be stored in one place. Allows varying user access for HR and managers. Allows full notes and information on candidates (and re-applying candidates) to be accessed quickly and easily. Would like to see better stats/metrics on the landing page (dashboard). Would like a photo of candidates to pop up for easier recognition. Wish it would integrate with Google easier. Great if you are consistently hiring year round. It keeps a pipeline of candidates easily accessible and gives the entire organization to keep up and assist in the hiring process. It would not work as well for a small organization who has just one-off hiring needs. JazzHR Review: "Make your hiring process efficient"
We are using JazzHR to manage our hiring process. 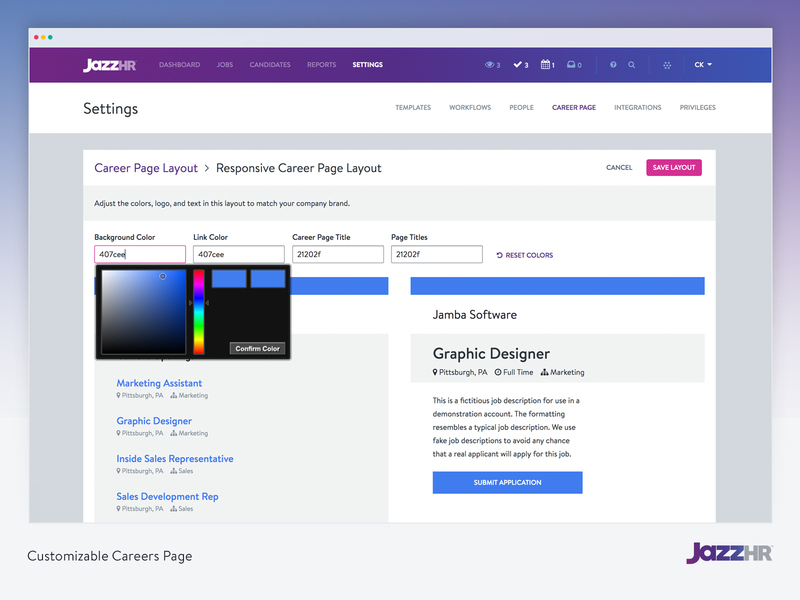 Our career site is hosted via a page provided by JazzHR. Our Hiring team publishes jobs via JazzHR on various recruiting portals. We are based out of India and we have got a good number of applications via our career site and free postings. It gets record interview feedbacks and runs our evaluation process effectively. The whole organization has a single database to refer to candidates and anywhere anytime access helps the team to look at candidates anytime. This tool has definitely helped us achieve our hiring goals. Lots of new features got added over the time. Almost everything to run hiring process efficiently. It is good for companies who want to get candidates without investing into various job posting sites. JazzHR Review: "Overall a good product for the investment"
Jazz is used to help manage candidates for a variety of roles within our organization, primarily high volume hourly positions at plants across the United States. The system has some very good basic features including questionnaires, email templates, rating systems and basic reporting. The workflow system is easy to change for individual job postings. The "push out" of jobs to the internet including Indeed is automatic. The system is fairly easy to use with very little training needed for users. Questionnaires are relatively simple to set up and modify. The candidate rating system is very easy to use. Job Board integration to paid job boards is not as smooth as I have been accustomed to at previous companies that utilized similar sized systems. That being said, for the investment it is definitely better than having no system at all. User feedback beyond standard support has not escalation process beyond "we will consider it in the future". Company website integration is basic "a-frame" with little customization. Inconsistent support help. Some representatives are very helpful while others just go through the motions. How likely I am to recommend Jazz is somewhat hard to rate as it depends on the company size. For companies in growth or standard hiring mode, where cost is a factor, the system does very well. There are some features, including some detailed reports, that I have not seen in larger systems. Our Client Services rep is very responsive and depending on who you get with support, issues are resolved, otherwise you need to get your Client Service Rep involved. It is very easy to use and I continue to learn more about the functionality. The Job Board and Social media integration is basic however; it is better than solutions do not offer it. User Review: "I am a huge fan of JazzHR!" JazzHR is managed by the HR team and is used across the entire company. It is helping us to streamline our recruiting process and we are also saving a lot on our recruiting costs. The functionality of the platform is automating a lot of what we used to have to do manually. You can create customized workflows, which is great so that you can use certain workflows for certain teams or offices. JazzHR keeps certain information (e.g. salary) hidden from certain people within the company, so we can have some info shared with hiring managers but not the interviewing team. 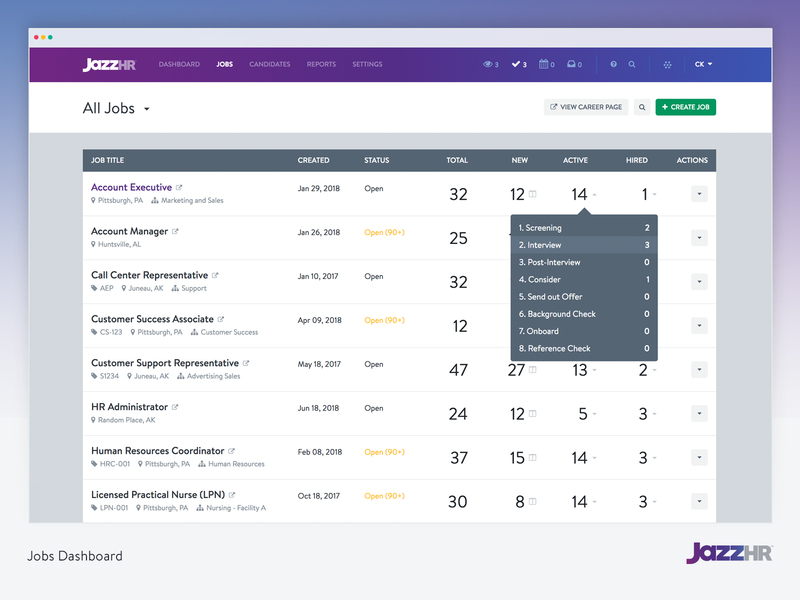 JazzHR syndicates to many different job boards so that we can great visibility on our open positions - and also easily lets you pay for additional job postings on paid sites. JazzHR keeps everything in one place - interview notes, application, offer letters, assessments, etc. I would like to see improvements to the application questions - there are certain questions you can not modify and I would like to be able to. Scheduling interviews is a bit tricky within the system, so I would like better functionality to schedule with interviewers through Outlook. I would like hiring managers to be able to select how many emails they get if they are added to a job as a hiring manager in the system. Right now they get so many emails some hiring managers don't want to be added to the job. I think JazzHR is great for small to large companies that want to automate many aspects of the recruiting process. I am the only person who manages recruiting for my company (just under 100 people) and it Jazz has saved me so much time. And it isn't difficult to setup, so onboarding and getting the system to work for you is very easy. I can't think of how JazzHR wouldn't be a good solution for a company - it may not be as helpful to very small agencies. JazzHR Review: "Intuitive and Highly Customizable - Best Value for Small to Med Sized Companies"
My company provides a range of talent acquisition consulting services, including helping clients with the selection and implementation of ATS systems. Most of our clients are seeking an ATS system that is easy to use, suitable for small to medium-sized companies, provides a central place to manage and maintain job ads (both postings on external sites as well as their careers page), interview process workflow (and automation where possible), feedback capture and discussion, scheduling, and integration with third-party onboarding systems. As a secondary need, they also want to build up a repository of qualified applicants for roles for which they are often hiring. User Friendly - Jazz is extremely easy to navigate and intuitive when it comes to it's use. 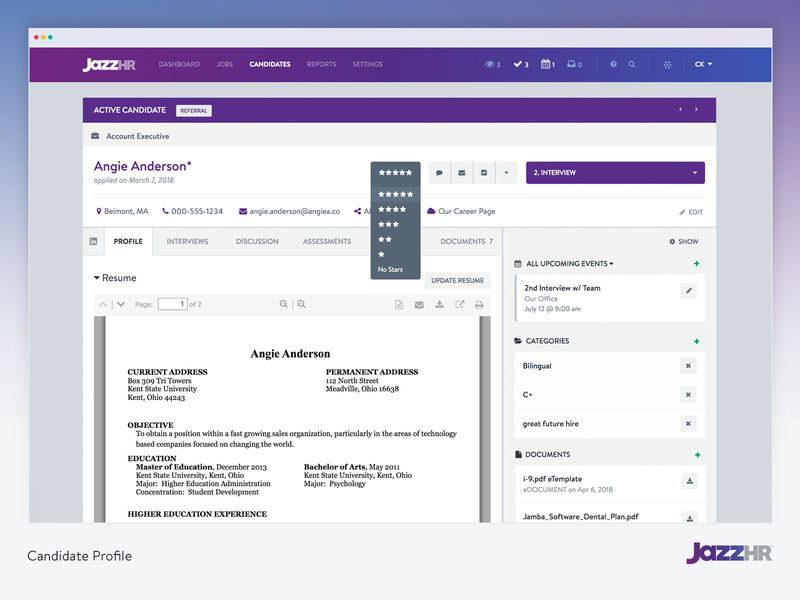 Customization - Jazz is highly customizable, and allows you to setup custom processes and communications with ease. I've rarely had to consult with the help feature in order to get things setup the way I want them. Jobs Posted Immediately - Jazz gets your Job Description out onto multiple sites as soon as you publish it. It also updates in real time, without having to manage a handful of passwords to varying job sites. MS Integration - Jazz, as well as a lot of their competitors, have not figured out how to integrate with Microsoft calendars, despite what the sales rep may tell you. Google calendars are easy enough, but depending on your setup, you may want to negotiate an exit clause into your contract. Scheduling automation is one of the biggest time savers and ATS can provide, so don't settle on that issue. Initial Setup - Even with an intuitive interface, the initial setup can be a hassle, requiring you to chase down busy people and get them to accept the invitations they sent. It may also take a while to get each job setup in such a way as to be a time saver for your hiring managers. Once you get it down though, it's worth every penny. Moving Between Categories - Sometimes the way the system moves from Jobs to Candidates, or from one job to another with the same candidate, just doesn't make sense to me. All ATS systems have this problem, but it seems like a development problem, not a user one. 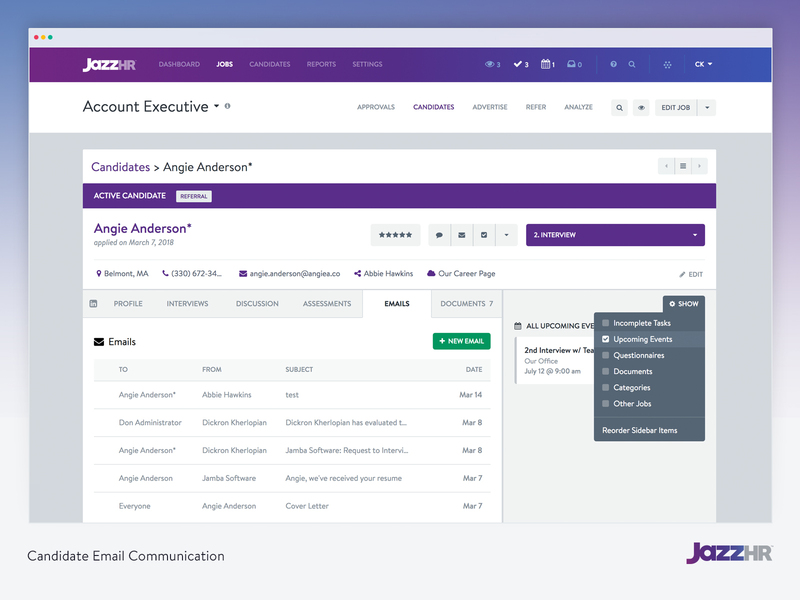 JazzHR is intuitive and customizable enough to allow a company to display a superior employment brand, without sacrificing too much on the automation side. I would recommend it to small to mid-sized companies that care about their branding, and whose primary needs relate to managing postings, workflow, and capturing feedback. Larger enterprises might not find the tools offered suitable to the volume of applications they receive, but larger ATS systems tend to invest less on the branding side. My only real caveat is in relation to their difficulty integrating with MS Calendars. Otherwise, my experience with JazzHR has been outstanding, and I regularly recommend it to clients. It is used across different departments within the organization. It helps us centralize all the candidate information and applications that we receive for our open positions. It also allows multiple people screen and review resumes/cover letters/applications for a single candidate. We can also create reports and analyze how well our recruitment efforts are from different sources. JazzHR is great for those who are looking for a simple, well-maintained ATS. The support team is quick to respond and they even have a live chat. The job posting syndication is great, and we like the features to analyze sources. However, we've found that the information isn't 100% accurate. I would prefer to have more customization available within the system to create different job categories. User Review: "JazzHR to the rescue!" We currently use JazzHR as our ATS. We use it to post each job we have available in the company. I like the syndication feature that JazzHR provides because it allows our job to be visible on multiple job boards at once. We are mainly using this to solve the issue of housing all recruiting/staffing activities in one singular place. I can control who has access to it and keep my hiring managers accountable for building and growing their own teams. Syndication of jobs to various job boards is awesome. This allows us to reach talent in various markets and industries. Adaptability for new users. Whenever I have a new person in my company needing to use JazzHR, they are able to quickly jump in and get a well rounded understanding of the platform, quickly. Reporting. I feel the reporting features of great. This allows me to explain more clearly to my executive team, how hiring is going and what areas we are falling short in. Keeping everyone accountable. Really can't think of any. I think sometimes the customizing can be a bit tricky for a particular job req. It's well suited for recruiting, and housing applications. I haven't used it much for onboarding as we have an internal process to handle that. Review: "JazzHR offers an excellent, affordable solution." We've used JazzHR (previously Resumator) for 7+ years here at meltmedia. It is a great inexpensive ATS that allows for a lot of flexibility in the application process, and keeps a complete history of all the positions we've ever posted. There is an option for an integration with Namely that is in the works that will provide further ease of use, I believe. JazzHR also has an integration the Premium LinkedIn accounts to immediately post your jobs, and give you options for many other free and paid sites for posting. A complete history of all positions ever opened, whether they are filled, put on hold, closed, or cancelled. The ease of "copy and paste" for your own job descriptions makes completing the posting much easier. The cost is relatively affordable. The integration for LinkedIn is only for the premium package of LinkedIn. Customer service isn't always the fastest, but it is always within 24 hours. I know it works well for a company our size. My HR team can open positions quickly, and allow managers chosen from a list to review resumes and rate accordingly. Moving the applicant through the process of screening is also easily tailored. User Review: "JazzHR - Recruiting Made Easy"
I currently use JazzHR for all of the recruiting efforts at my current office and have been using it for over 3 years. Jazz is very user friendly and makes it very easy to communicate with and track applicants. Jazz also allows me to share candidate information with hiring managers and push certain reqs onto paid job boards if needed. Incredibly easy to quickly post jobs on their platform. Jazz provides feedback on your req and recommendations for edits. Easy to loop in and share screening info and notes on applicants with hiring managers. Not so much an issue with Jazz, but would love to have access to more free job boards. Jazz does constantly make improvements and add features, however it would be nice if they had video interviewing capability. Currently we have to use an additional plug in for this. It would be great if Jazz could offer discounts or specials on the paid job boards. Jazz has been great for all areas of our recruiting. Their integrations work well and it has been easy to use with plug-ins and adding to our HRIS system. In addition, applicants are easy to keep track of and communicate with and information about the candidates can be easily shared with other team members. JazzHR Review: "Excellent ATS for any growing SME"
At Total Access Urgent Care (TAUC), we strive to create fast, friendly, affordable healthcare, so finding the best people for our team is critically important. We currently have 250 employees, and we use Jazz across the organization. (Providers can submit their resume and application through Jazz, but Provider recruiting and hiring is still more a manual process given their roles.) 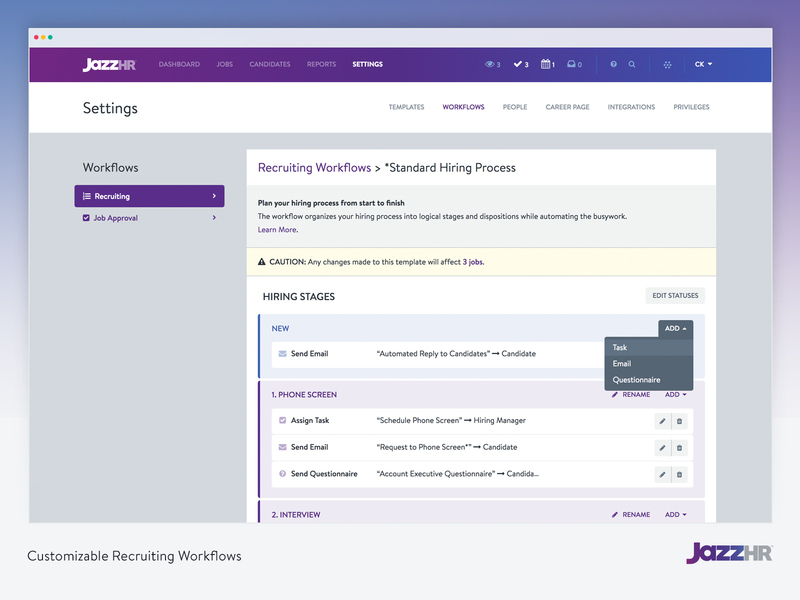 Everyone else applies through our website or a job board (thanks to Jazz) and we've created the hiring workflows in Jazz thanks to the user-friendly and customizable Jazz system. Excellent platform to keep the entire team on the same page for each applicant. Easily handles the postings to all the job boards (if desired - you don't have to post to the job boards if you don't want). Customizable workflows to design the ideal hiring experience for each job position. Great support team to help answer any questions. 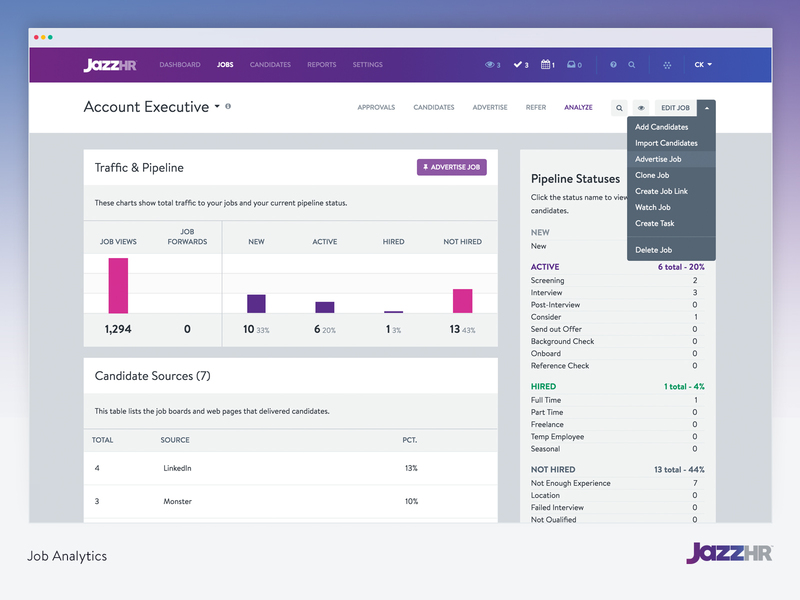 Jazz is extremely well-suited for any position where people apply to work at your team because the emails, workflows, and system make it very easy to screen, interview, and track hundreds (or even thousands) of applicants. For companies with few applicants (less than 100 per year) or roles where the recruiting is more delicate/manual (like hiring Physicians), then perhaps explore other options. JazzHR Review: "You won't regret it"
I am very content with Jazz. Our company is in the process of encouraging all of our hiring managers to be solely dependent on Jazz for our hiring/on boarding process. We especially like how we can vote to advance candidates to the next stage, or simply reject them. We also like how we can categorize our candidates as to why they were not hired. We look forward to building our own resume database so that we can develop a pipeline of candidates for more positions that will eventually be featured. Jazz is very easy to navigate, and if I ever get stuck, they have a great customer service team that is always willing to help. Overall, it really helps in facilitating and organizing the onboarding/hiring process. Easy to create a candidate. Provides the ability to create assessments. Easy to create questionnaires with mandatory questions that should be answered. It would be nice to re-post jobs on a weekly or bi-weekly basis to get more exposure. It would be nice to customize the workflow process when posting a position without having to go to the workflow template in the admin portion of Jazz. Consider having some ready-made assessments during the interview process that we can use instead of creating our own. Jazz is overall well suited - I just like the idea of customizing a workflow without having to go back to the template. JazzHR Review: "Jazz @ Aeria Games: a true gain!" At Aeria Games we use Jazz as the sole recruiting tool for the whole company. Both HR and the operational departments use it intensively, from job description set up to posting, screening, contacting candidates, giving feedback etc.. It is a great tool to easily communicate about the applicants with the operational teams. It is easy to use and the feedback from all users has been exclusively positive so far. Our recruiting process is pretty tailored to the needs of the hiring team. Jazz is great in supporting these customized work flows and offers a wide range of changeable templates as well. Furthermore, we have a lot of users who need access to Jazz. As the user amount isn't limited, it is really easy to reach out and involve all our stakeholders. When using the reporting option, it takes some time to figure out what you want and how Jazz is displaying it. It is pretty much all there, but I think it can be clearer and easier to use. JazzHR Review: "Jazz is great!" I used Jazz at an advertising agency where I used to work. The entire organization (with offices in two separate cities) used the system. I believe that our recruiting process was streamlined very well with Jazz, as their workflow features allowed our managers to get their duties done much more quickly. I can't think of anything--I've used a few other ATS options and Jazz shines above them all. I was highly impressed with the functionality, attractiveness, and usefulness of the system, not to mention the great support department! Anytime I had a question or concern about the system (I rarely had concerns), I received a response within 24 hours in my preferred method of contact, which was extremely helpful to me. JazzHR Review: "The Resumator Gets the Job Done!" We use The Resumator to post open job descriptions to our website and free job boards, accept inbound applications, screen resumes, message candidates, and track the hiring process for every department across the organization. It streamlines our entire hiring workflow and allows us to collaborate on evaluating and selecting candidates. Without The Resumator, we'd still be manually posting job openings, sorting resumes, and struggling to track applicants through the hiring process, which is made especially challenging given our globally distributed team. Creating job descriptions and syndicating them to free job boards to attract inbound applicants. 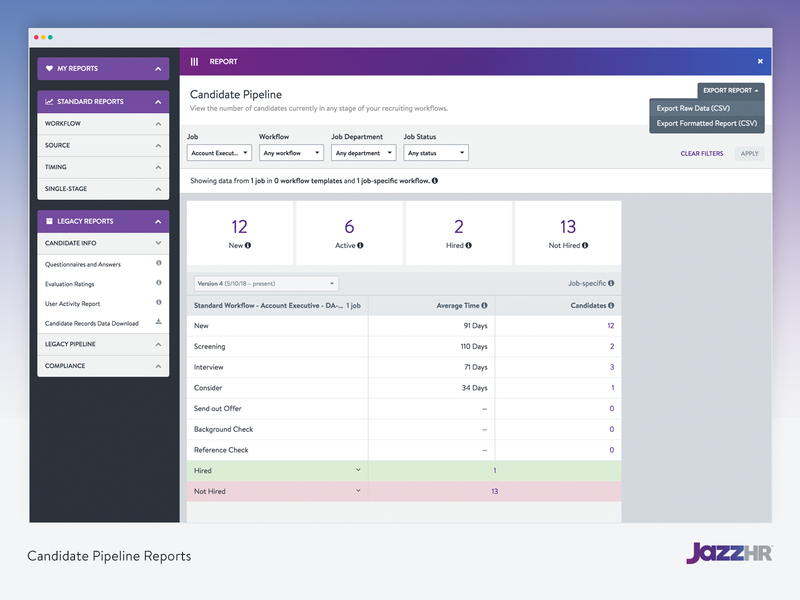 Simplifying the candidate screening process by organizing applicant information, resumes, interview notes and feedback, and more all in one place. Allowing teams to collaborate on candidate reviews and post comments for others to see. Merging duplicate applicant profiles is difficult to do in bulk and weeding out spam or accidental / incomplete profiles can be time consuming. The Resumator allows applicants to apply via LinkedIn but doesn't pull in much social data (i.e. who are my shared connections with an applicant) or serve up data from other social accounts like Facebook, Twitter, etc. The mobile version of the site is almost impossible to use. I wish I could create interview notes templates for certain departments or positions with the questions I plan to ask each applicant and then fill in my notes on their responses during an interview. I would use The Resumator at any company. In fact, I've recommended and implemented it in my last 2 companies. I have found it much more robust and easy to use than several other solutions I previously evaluated. While my experience has been limited to advertising, technology, and digital media companies, I don't see why The Resumator couldn't be used in other industries or organizations. The Resumator is used as our applicant tracking system. Every open position is documented in The Resumator and every individual that applies is housed there. It is being used across the whole organization and it addresses our need to have a centralized application that houses all of our candidates. It's pretty robust in regards to what all it can house as far as information is concerned. They seem to change their product and UI almost on a monthly basis, this gets a little agitating when I'm getting accustomed to the new interface. It should allow us to use a personalized signature - just like ours for our email accounts at work. The biggest needs to address would be 1) size of organization, 2) number of job openings, and 3) how many applicants you typically get on an open job. If these numbers are extremely large you'd need to find a more robust application. JazzHR is a powerful, user-friendly and affordable ATS and recruiting software. 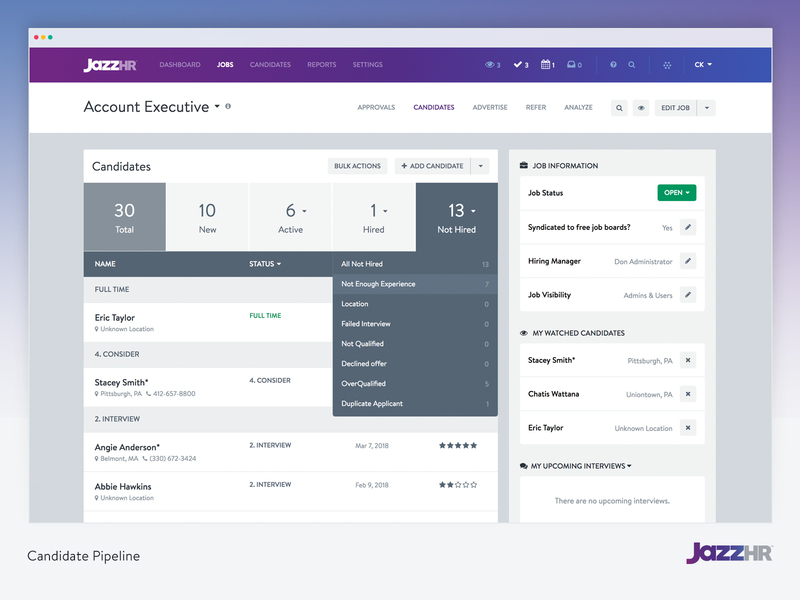 JazzHR aims to replace antiquated hiring processes like email and spreadsheets with an intuitive applicant tracking system that helps recruiters and hiring managers build a scalable and effective recruiting process that consistently results in great hires. 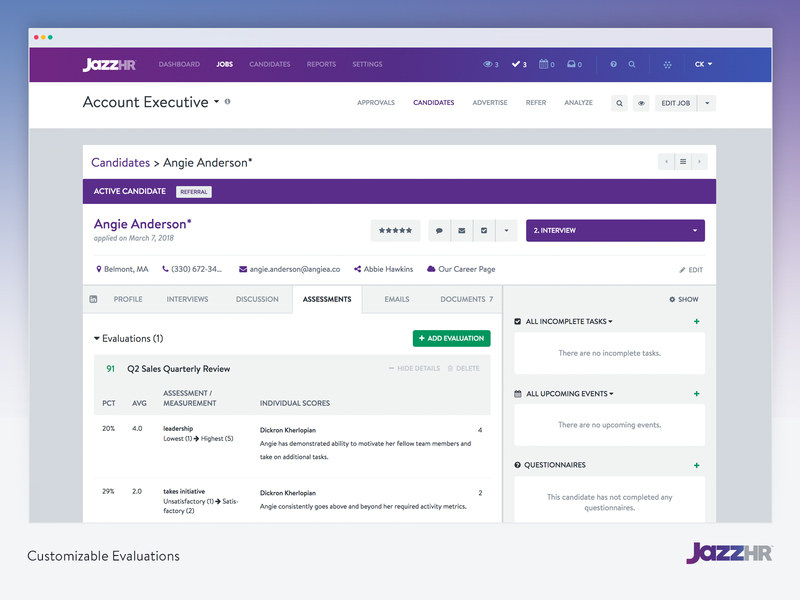 View candidate's profiles at any time from one central location.Welcome to the JazzHr dashboard. 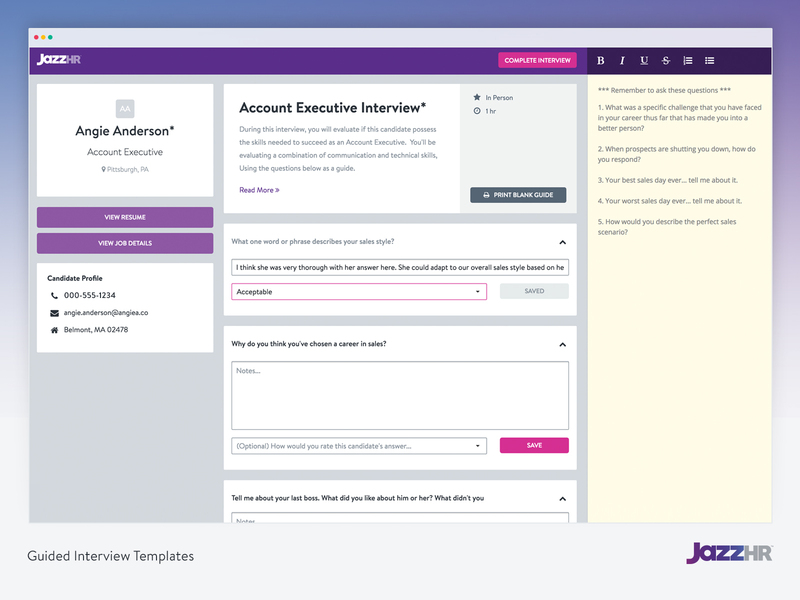 Here's where you'll manage all your open jobs.With JazzHR, you'll get access to your own, customizable careers page.The candidate pipeline shows you what stage of the hiring process candidates are in.Easily communicate with candidates with bulk actions and custom email templates.JazzHR offers customizable evaluations and assessments.Customize recruiting workflows to reflect your hiring process.Come prepared to every interview with JazzHR's guided interview templates.See which jobs and job boards are performing with JazzHR's Job Analytics.Gather data and create custom reports for easy viewing.